"The Sparrow's Home, Union Square, New York City"
Evidently New York City’s pigeon population is declining, and the English sparrow and European starling have assumed most-hated status. It’s hard to imagine that once upon a time sparrows were so desirable that the city built houses to keep them happy. Originally, officials decided to import the birds from England to fix an urgent problem: caterpillars were munching on the leaves of shade trees. It was believed that the sparrows would eat the caterpillars. 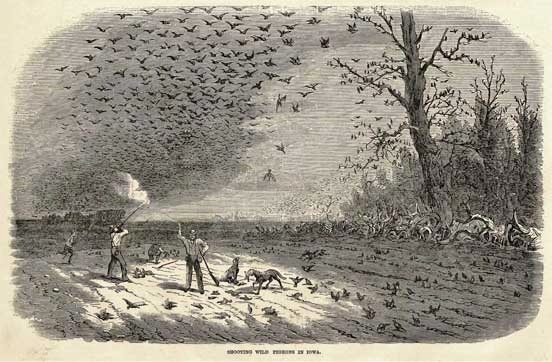 During the 1850s, Brooklyn tried several times to establish a population but the birds kept dying. Finally, several broods were let loose at Greenwood Cemetery and a man was hired to tend them; they flourished. Soon enough, the city of Portland, Maine, acquired its own sparrows. Then Boston brought them to the Common. During the Civil War, hundreds were set free in the parks of Manhattan. By the 1870s, Philadelphia, New Haven, Galveston, Salt Lake City, and San Francisco had large sparrow populations. The U. S. Department of Agriculture scientifically investigated the contents of the stomachs of a large number of English sparrows, and reported that, aside from the destruction of weed-seeds, very little is to be said in the English sparrow’s favor. In reference to the insects destroyed this statement is made: ‘Out’ of five hundred and fifty-two stomachs inspected by the Biological Survey, forty-seven contained noxious insects, fifty held beneficial insects, and thirty-one contained insects of little or no importance. What a waste. But nothing could be done. 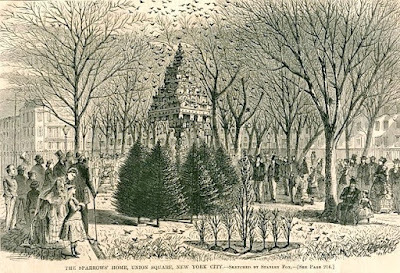 Fortunately, there’s one pleasing relic of the sparrow’s halcyon years: a wood engraving of a giant bird house in Manhattan’s Union Square Park, circa 1869. Its creator, Stanley Fox, worked as an illustrator for Harper’s Weekly, the leading news magazine of the day, where the picture first appeared. Mr. Fox was born and lived much of his short life in rural Little Falls, N. Y., 200+ miles northwest of New York City. 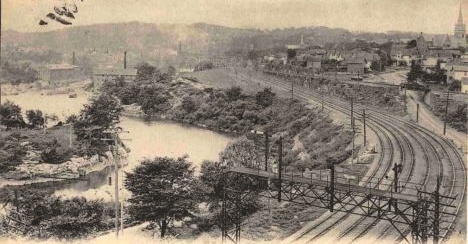 The town lies in a deep gorge of the Mohawk River. Its dairy farms thrived because the Erie Canal passed right through. In 1865, when Stanley Fox started working for Harper’s, the editors sent him south for the last year of the Civil War. He drew Fort Sumter and black soldiers arriving at Hilton Head. His picture of President Andrew Johnson pardoning rebels at the White House snagged the magazine’s cover. After the war ended, Fox returned to Little Falls but continued to work for Harper’s. Now the editors wanted illustrations of topical urban scenes, which often required Fox’s presence in the city. He must have commuted back and forth on the New York Central Railroad. Stanley Fox’s engravings are not in the same league as the work of Winslow Homer and Thomas Nast, who also contributed to Harper’s Weekly. However, in addition to the sparrow palace at Union Square, Fox nicely captured various scenes around town: a thoroughbred horse race, a blizzard, a county fair, the Central Park Zoo, and boys swimming in the East River. When the destitute widow Mary Lincoln exhibited her wardrobe in New York City, hoping to raise money by selling her gowns, furs, and jewelry, Fox’s drawing helped promote the show. And on May 30, 1868, Fox visited a Brooklyn cemetery to sketch visitors decorating the graves of the Union dead. The indigent pleading for mercy at Jefferson Market Court in Greenwich Village . . .
A police wagon dumping a motley crew of men, women, and boys at New York City’s notorious prison, the Tombs . . .
Identifying the dead in a morgue . . . Vulnerable immigrants and sly employers negotiating at Castle Garden. . .
One of the striking things about Fox’s engraving of the “Sparrow Hotel,” as the New York Times referred to it, is its resemblance to a nineteenth-century print of farmers shooting the passenger pigeons that used to fill American skies. During the very same years that the sparrows thrived, the over-hunted passenger pigeon became extinct. 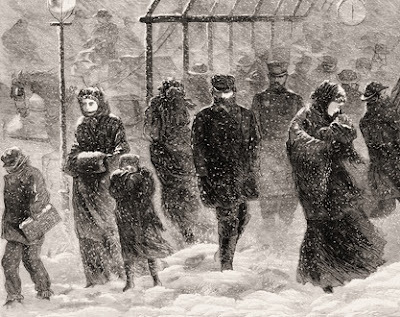 One thing that is generally lost to history is an awareness of what real, daily life was for a poor or working class person in New York (indeed the world). That drawing of a prison van discharging at the Tombs -- can you imagine what prison conditions would have been like back then? I'm reading Devid McCullough's 1776 and his description of typical revolutionary war soldier -- oh my God, they would wash their clothes unless women did it. And the drinking! All day long, all the time. And then to think that our great great great grandparents lived just like everybody else -- it's all very unreal. The extinction of the passenger pigeon -- like the near extinction of the bison, still remains genuinely shocking to me.